Having just returned from a mammoth European tour supporting Brant Bjork, Danish fuzz rock trio the Sonic Dawn unleash ‘Eclipse’, the band’s third album. Despite this being 2019, The Sonic Dawn are firmly ensconced in the late 1960’s. They look like it and sound like it. Indeed the first track on this album, ‘Forever 1969’, opens with the line ‘Forever 1969, some say that we are out of our time’, which is extremely apt. It’s a pretty cool tune too. You have to admire these guys’ admiration of, and dedication to, the psychedelic scene of the late 60’s because they manage to recreate it to the finest detail with this new album, and the production if faithful to the time too. ‘Eclipse’ contains 13 slices of sonic psyche rock/pop, with most of the tracks clocking in at under three minutes, so these are short, sharp and sweet psychedelic nuggets. The likes of ‘Psychedelic Ranger’ and ‘No Chaser’ pack an up-tempo, fuzzed up punch, whilst ‘Opening Night’, ‘On The Edge Of Our Time’ and ‘The Last Page’ have an altogether more laid back, dreamy feel to them. ‘Love Bird’ and ‘Christiania’ have a bit more of a pop quality to them, and at over five minutes, the album’s closing track ‘Towards The End’ is an epic in comparison, and an album highlight, slowly building from a delicate first half to an organ-soaked uplifting jammed out crescendo. The musicianship and vocal work are spot on throughout, and there’s plenty of good use of keyboards too. 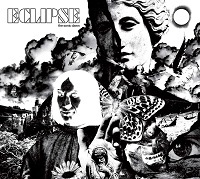 ‘Eclipse’ is a studied and well executed throwback to the days of west coast psychedelic rock. There’s nothing new or ground breaking here, but that isn’t the intention. So if you want to party like it’s 1969, check out this ‘Eclipse’. ‘Eclipse’ is out now. You can get your copy HERE.